The Vintage Motocross Club returned to the home circuit at Narrogin for their July 13 race day and members were greeted with cool winds, sunshine and a beautifully graded racetrack. This day was to be a special one for the Narrogin community as it had been designated as the Club’s 2014 Charity Day, with the Narrogin Freemason’s taking the chance to hold a lunch time sausage sizzle and to keep all monies raised, for distribution to local people in need. In addition the Club donated a portion of the day’s riding fees to this great cause. The canteen was certainly flat out with hot dogs and cool drinks racing out of the building as fast as the A Grade solo class. Most guys had one in each hand and the lucky ones had another hot dog in their back pocket. Good use was made of the club’s tables and chairs set out in the spectator area by the start line and there was lots of bike talk and race stories being exchanged during the lunch break. By the end of the lunch interval President Gary was very proud to hand over a total of $780 to the Narrogin Freemasons for their distribution. The smiles on everyone’s faces told the story. Well done VMXWA! Well what about the racing. Sunday morning started off with the sweet sounds of 2 stroke and 4 stroke vintage motocross bikes being warmed up for the start of another exciting day of racing. The capacity racing is proving to be very popular, with 48 entries and about 60 bikes in the pits. Good sized fields faced the starter in every class and some awesome battles were witnessed throughout the day. The 125 cc curtain raiser saw an exciting battle between Warren Patterson #78 and Ralph Miller #311 who swapped the lead several times, lap after lap before Ralph took the chequered flag just ahead of Warren, followed closely by Paul Gibbs and Hayes Forsythe. Ron Chandler and Stuart Aldred followed them home in 5th and 6th. It was all Warren Patterson on the 125 Elsinore for the rest of the day, with Paul Gibbs and Hayes Forsythe keeping him honest and making him earn every win. The 250cc class was dominated by Brooke Lawson, who we haven’t seen in action for some time. Brooke has lost none of his class or his pace and he was an exciting rider to watch on the 250 Yamaha. Brooke took out all 4 of the 250 cc races with Rick Speak, Lew White, Gary Johnson, Ian Brown Mike Gordon and Mick Godbold, sharing positions 2-4 all day. These guys were battling one another race after race and certainly put on a top show. When it was the big boys’ turn to play, the 251 cc and over bikes came to the line. Scott Lawson #11 and Paul Gibbs #173 shared line honours with 2 wins apiece and these 2 guys had to work hard all day to stay in front of one another and also to fend off strong challenges from Mike Lawrie #47 and Russell George #888. Robert Dillon, Fred Dillon, Gary Johnson, David Jones and Will Plummer kept popping up during the day, keeping the fields honest. The Golden oldies (Over ‘55’s) were in force once again, making this class the biggest on many occasions. With riders of the calibre of Derek George, Steve Hanson, Stan Read, Frank Barron, John Howell and Alan Mitchell it was fireworks from start to finish. No one told these guys that they were over 55 and that most of their non motocross mates were at home watching telly or having an afternoon nap. I’m sure some of these boys are still as fast as they were 30 years ago. The day’s honours went to Derek George #688 (3 race wins) and Alan Mitchell #69 (1 race win). The sidecar class was literally a swingers party with riders, passengers and bikes swapping around for each race. 5 outfits turned up on the day, but unfortunately a couple of them developed engine gremlins in the pits overnight on the Saturday and didn’t want to run on Sunday morning. Andrew Irving and Russell George on the #51 machine were the boys to beat this weekend and we also saw Sarah and Fred Dillon take a win on Gary Johnson’s “red terror” #25, and then Dave Christie/ Paul Gibbs took it out for a spin in race 2. Not to be outdone, the same bike had Dave Christie/ Robert Dillon on board in race 3 and finally Fred took the bars and won the final handicap with big brother Robert swinging. It was great to see one of our sidecar stars from the 1970’s in the pits. Jack and Marg McDonnell often travel over from Wagin when they know the sidecars are racing at Narrogin and they stopped in for a look. 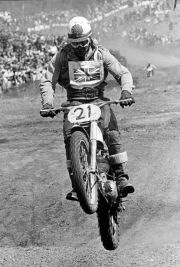 I think Jack secretly still wants to throw a leg over one of the Norton Wasps and cut loose for a few laps, he was legendary on his own Norton and usually lead the big fields back in the day. Staying with tradition, the final race was an all in solo handicap which was run over 5 laps. Trevor Lobegegere on the #70 machine lead the big field out of turn 1 and up the hill. He was followed by Fred Dillon (now on #77). Lap 2 it was Fred Dillon who had worked his way to the front, but lap 3 saw another leader #11 (one of our new members on Scott’s 250 Elsinore). Brooke Lawson had worked his way up to second spot by the start of lap 4 but his handicap had been severe and the gap between him and the leader was still a long way. At the start of the last lap it was still #11, Brooke, with Rick Speak on #14 moving up to 3rd and looking for some of the pie. He was followed by Ian Brown #96, Paul Gibbs, #173 and Russell George on #888. The pace was a cracker but there was no catching that elusive Elsinore and the final result did not change on the last lap. And so ended another day in the life of VMX WA with lots of happy faces, a few broken bikes, but no broken bones. Machines were washed and loaded, the last of the hot dogs were discovered and devoured and everyone headed for home to get those bikes and bodies ready for the next event. Next meeting is this Sunday 27 July, again at Dandaloo Park, Narrogin. The feature race for this meeting is pre-70 solo machines. This will be the final shakedown for the Annual Mill Farm Scramble at Wandering next month as well as the National Titles in South Australia, where a large and strong contingent of WA competitors will be headed. Free spectator entry, everyone is welcome.